Time For Customer Of The Week Again! Hi friends! Welcome to another edition of Eye Spy Presents: Customer Of The Week starring the handsome and friendly gentleman that you all know and love………….Eric! You may or may not know this, but Eric is a guy on the go and he needs stylish eyewear that can keep up with him. Theo Mille +23 is a simple design with some great details! 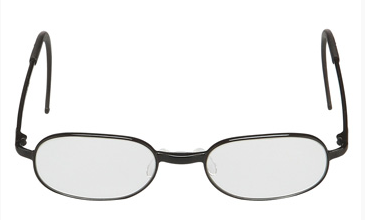 It is made out of titanium that is both strong and light & comfortable to wear. The shape is very graphic and has some nice angles that make Eric look great. The warmish grey color with a matte finish goes perfectly with his contemporary style….and big smile!! 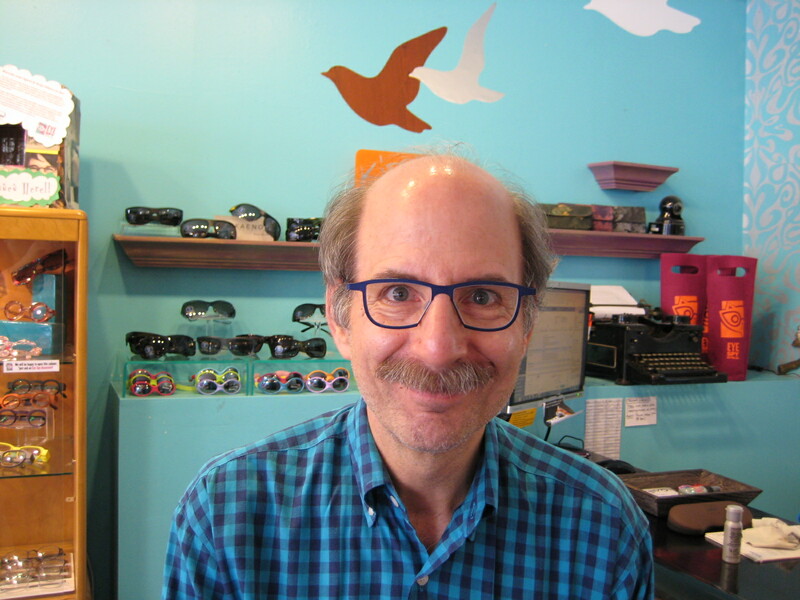 Eric is thrilled with his new frames and will definitely be back for his next pair of specatcular specs! 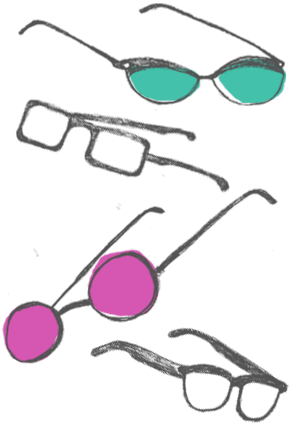 Here at Eye Spy Optical we LOVE glasses (duh!) and we LOVE recycling (yeah!). 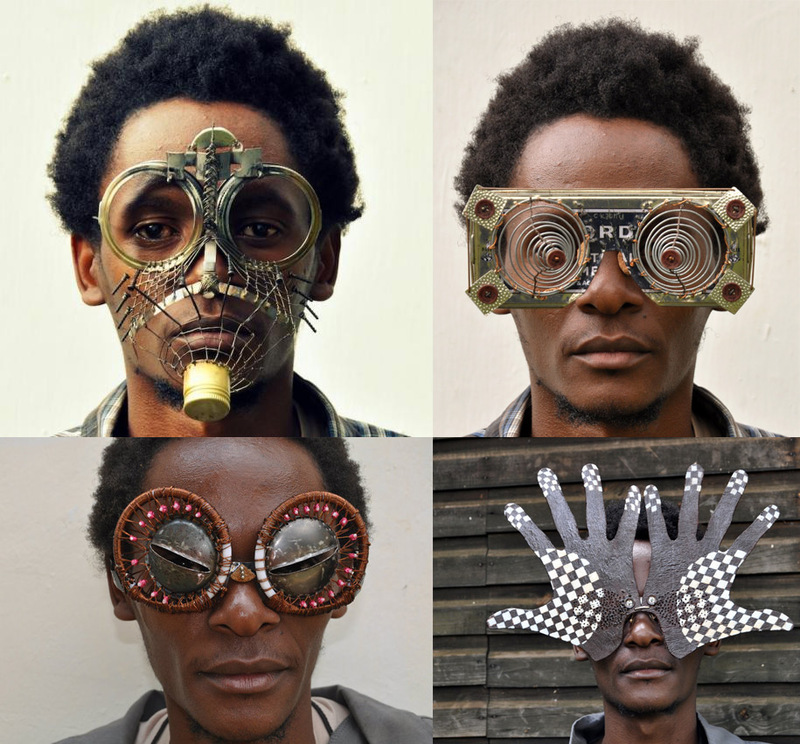 Cyrus Kabiru, a Kenyan artist, brings together the best of both worlds with his out-of-this-world creations. While they probably won’t improve your vision, you have to admit that they could give you a new outlook on life. Watch a video and learn a little more about him at This Is Colossal and at his website. Recently Refinery 29 published and article titled “Why I Stopped Dressing ‘Hot’ and Started Dressing ‘Weird” by Laura Ruof. Where Ruof takes us through her teenage years when she tried to be daring and show her love of “weird” but just couldn’t hang. She was teased and worried about what others thought. She further explains her journey from “hot” to “weird.” Through this Ruof learns to dress for herself, simple in concept, she exoplores what makes her happy and how to dress that way. It is a refreshing take on how to dress, in a world that has taken to body shaming all to often these days. Here at Eye Spy we believe that you should dress for your self. 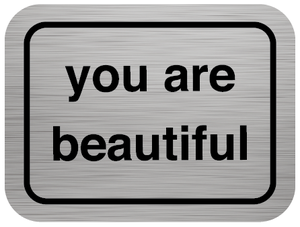 You are the one who needs to feel beauiful and comfortable with not only your glasses but your whole self. Give three big cheers for Derek, our new Customer Of The Week!!! Hip Hip Hooray!!!!! Derek is an awesome kid who was super excited to get his first pair of glasses (just like his dad!). 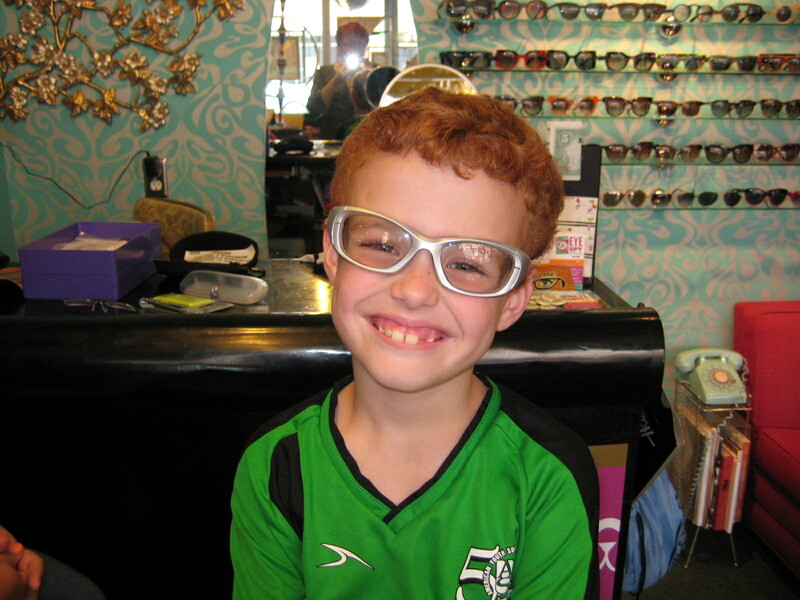 It didn’t take him long to decide on a colorful pair of SwissFlex Kids frames in kelly green – which just so happens to be his soccer team’s color this year (fingers crossed that he gets green again next year)! SwissFlex is a great brand for kids frames because they are flexible and can stand up ruff-and-tumble play time that kids get into. Derek learned how to put his glasses on with two hands and how to clean his lenses so that they will last a long time, but I am sure that he will put those frames to the test! 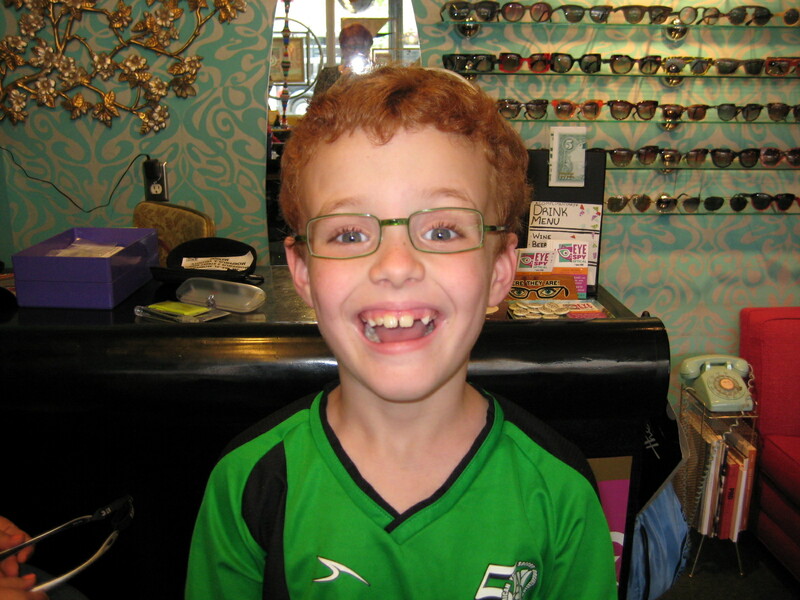 Derek is a sporty kid, so he also got a pair of silver Rec Specs sport frames. They have an adjustable elastic sport band in the back and a padded nose pad so they won’t move around while he is on the run. He needed something that could do double duty so he can wear them when he is outside playing soccer and when he is shooting hoops inside, so we hooked him up with some transitions lenses that change to sunlenses when he goes outside. Derek is thrilled with his new glasses – just look at that smile! Hi-Fives for Derek! Clap your hands for our new Customer Of The Week…Calvin! 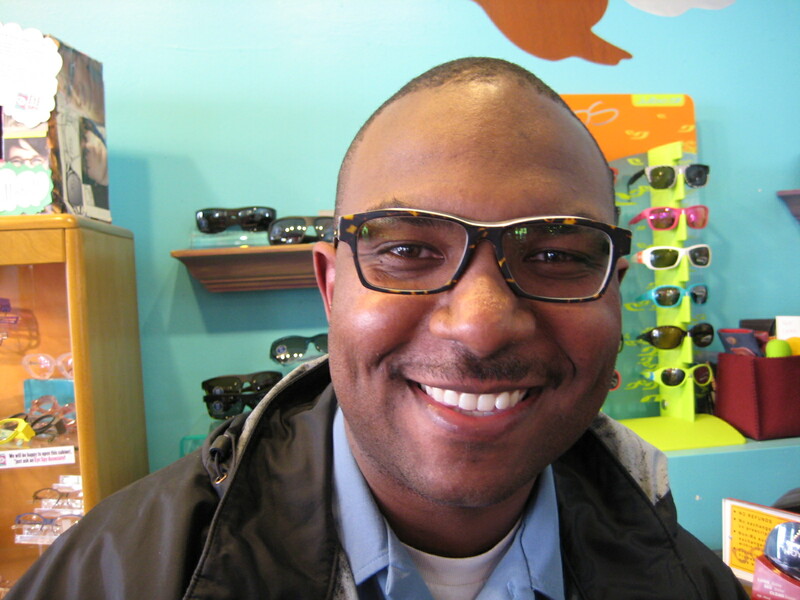 Calvin bought his first pair of specs from Eye Spy wayyyyyyyyyy back in 2001 and has been a loyal customer ever since. 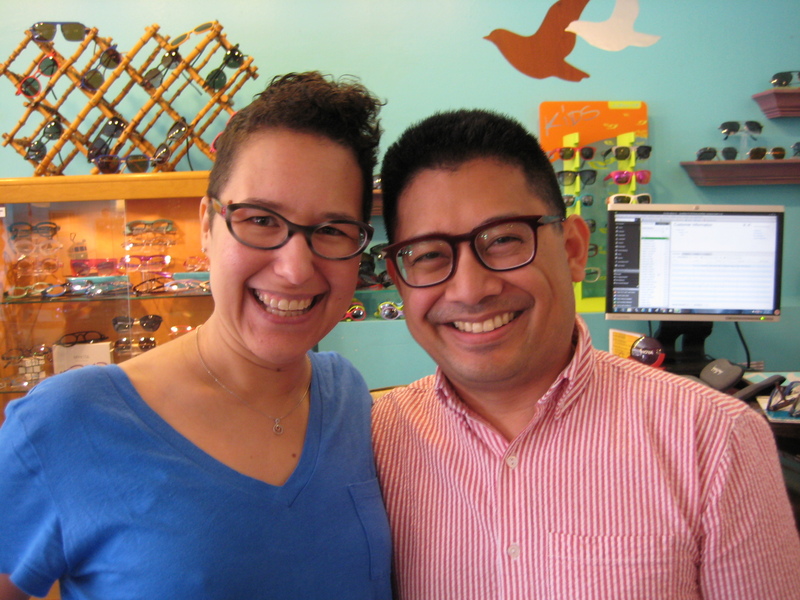 On Calvin’s last visit, he was looking for a new pair of cool new specs and our Design Maven, Sara, was quick to find a great pair of new Piero Massaro frames. 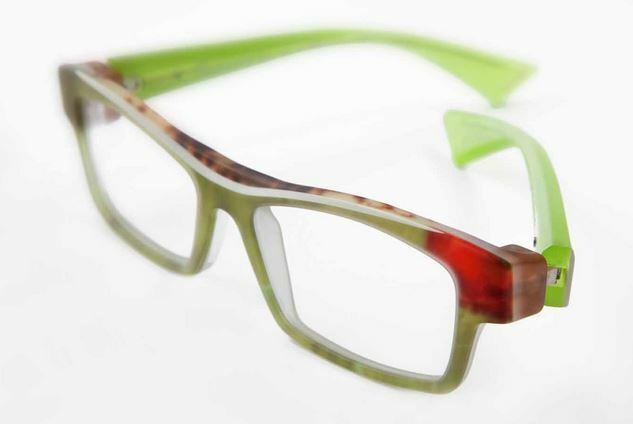 These handmade Italian frames are so comfortable and stylish with their handmade acetates and fun details. Eye Spy is one of the few shops in the US to carry these unique frames and the designer only makes 100 of each frame in each color, so you won’t be seeing anyone else in Calvin’s new specs. 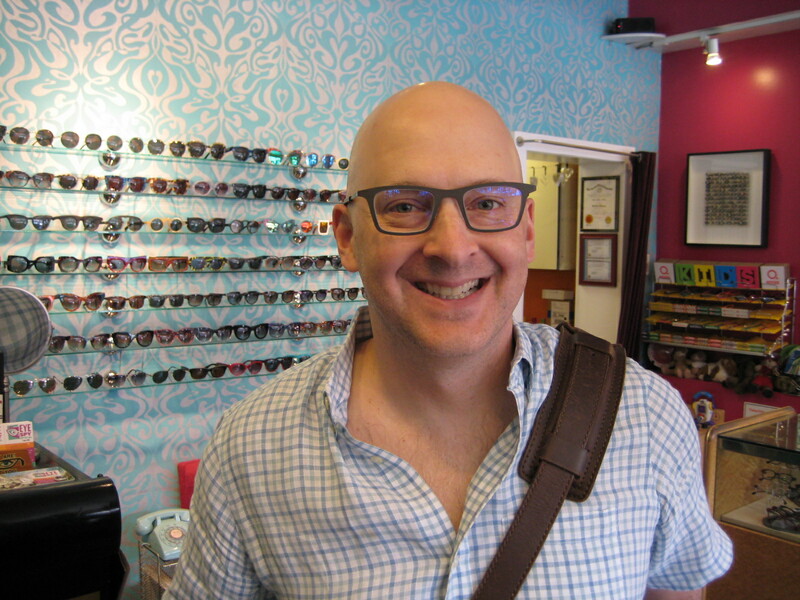 Calvin looks stylish and cool in his new frame and we are sure he is out there getting compliments right and left! Happy Day to Customer of the Week…Phyllis!!! 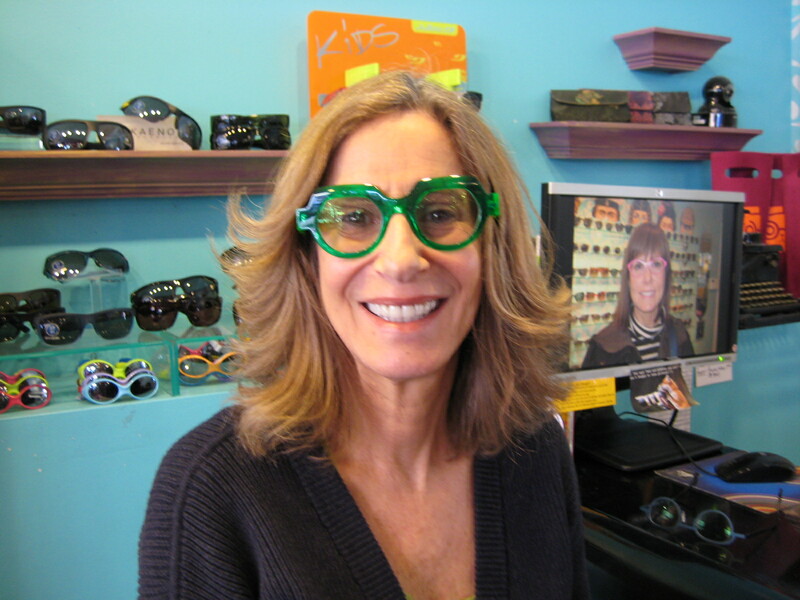 Phyllis was getting too much attention in her limited edition kelly green Anne Et Valentin Sagan sunglass-turned-optical frame – not the WORST problem to have – so she came in to find something a little more understated…perhaps even “boring.” Our Queen of Specs, Alissa, took on the task and did her best to help out Phyllis by selecting an elegant Move frame by Theo in a soft blue that really complements Phyllis’ eyes and skin. 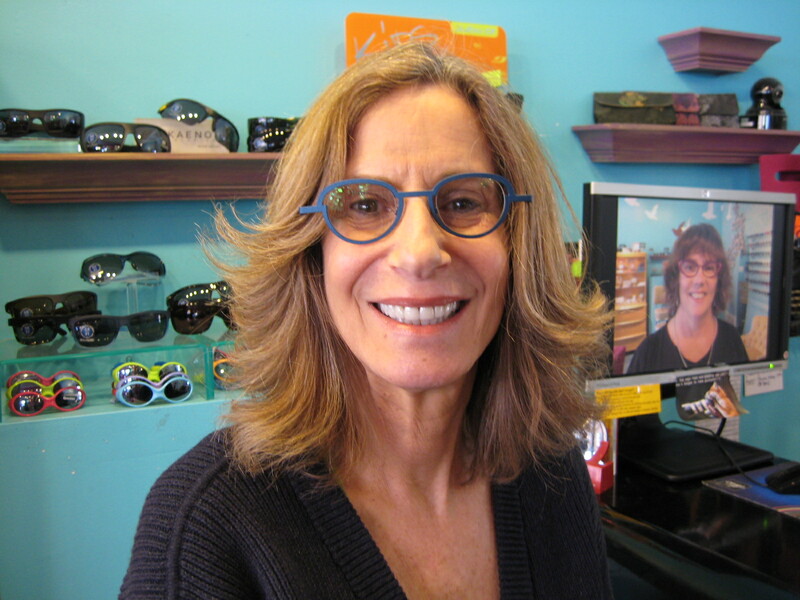 Unfortunately, Alissa’s attempt at choosing a boring frame wasn’t as successful as she thought, because Phyllis called us up the other day to tell us that she has been getting stopped on the street because of her newest frames too! People just won’t leave her alone! The nerve! We love the new frames and think she looks amazing. 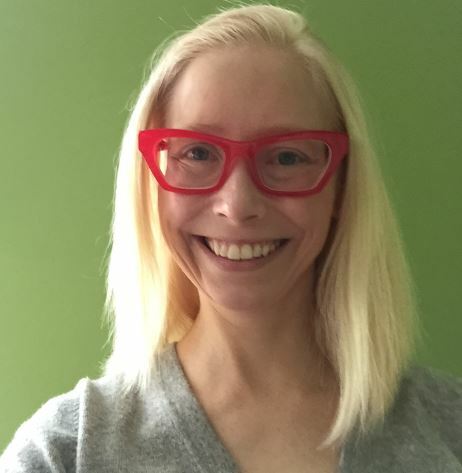 If you want to go tell Phyllis how much you LOVE her glasses, you can find her being a rock star realtor at Baird & Warner, volunteering at PAWS or walking her three rescue dogs…. Hi All! 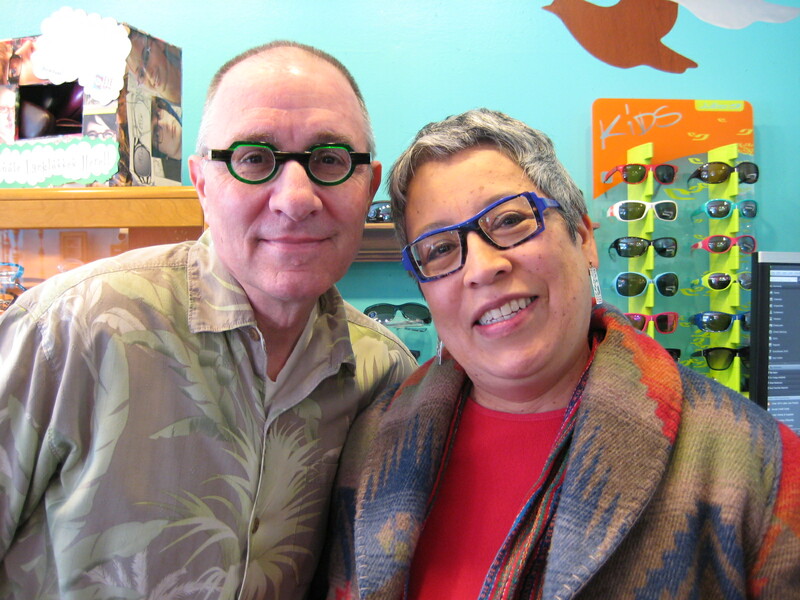 It is time for Customer of The Week again, and this time we chose a lovely customer who walked in with a pair of ho-hum tortoise specs, and left with some COLOR! Congrats to Katie!!!! 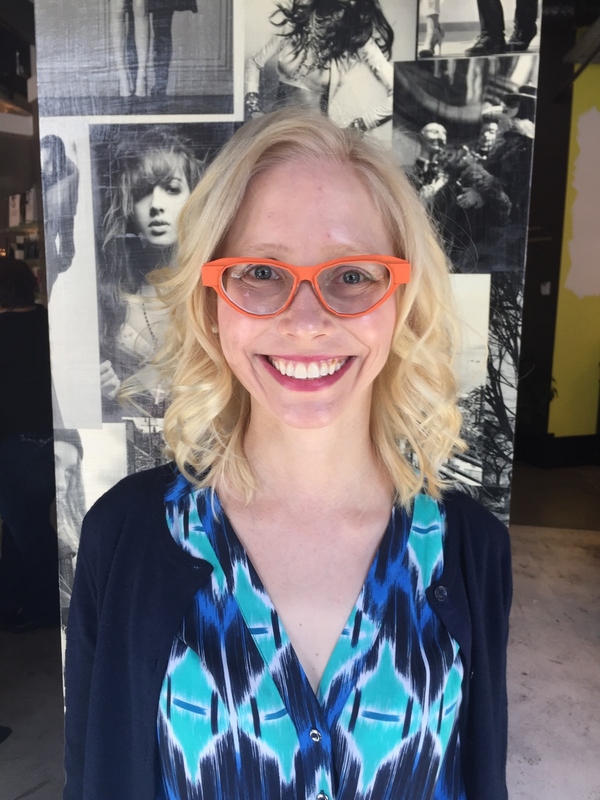 Katie is a world traveller and a professor in Indianapolis, IN and she knows awesome eyewear when she sees it. 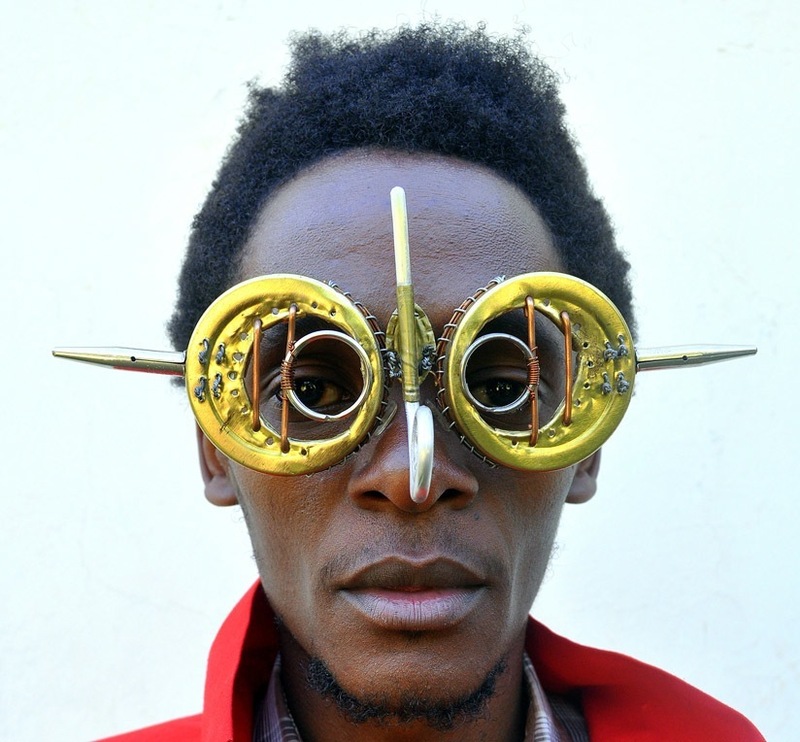 She had heard tales of a magical eyewear boutique in Chicago that carried an amazing collection of funky fun eyewear. One early Saturday morning she set out on her journey, in search of this magical oasis. She endured an arduous journey full of stop-and-go traffic and evil construction monsters, but after several hours she made it to the store where beverages were offered to quench her thirst and lovely ladies helped her find the glasses of her dreams. Katie was wearing a pair of ho-hum tortoise glasses and practically gasped at the rainbow of specs before her. 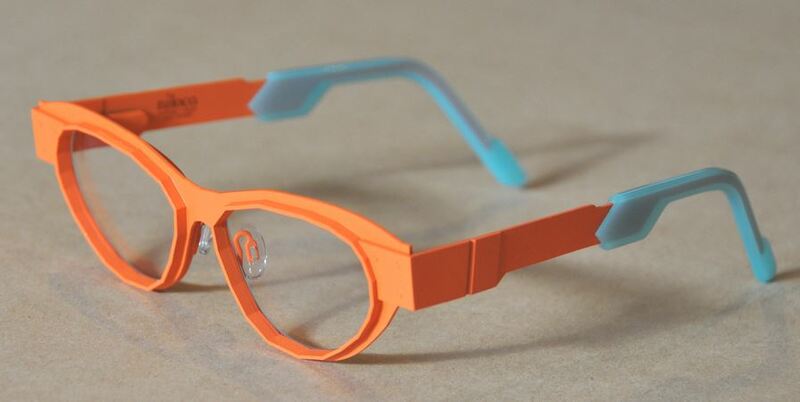 She tried on many pairs, but they were too small, too big, or just somehow not right…that is until she tried on a pair of fun and funky metal pair of Niloca Clockwork glasses in a fun bright orange! They fit like a glove and had fun 3-D details and those dreamy sky blue temple tips! 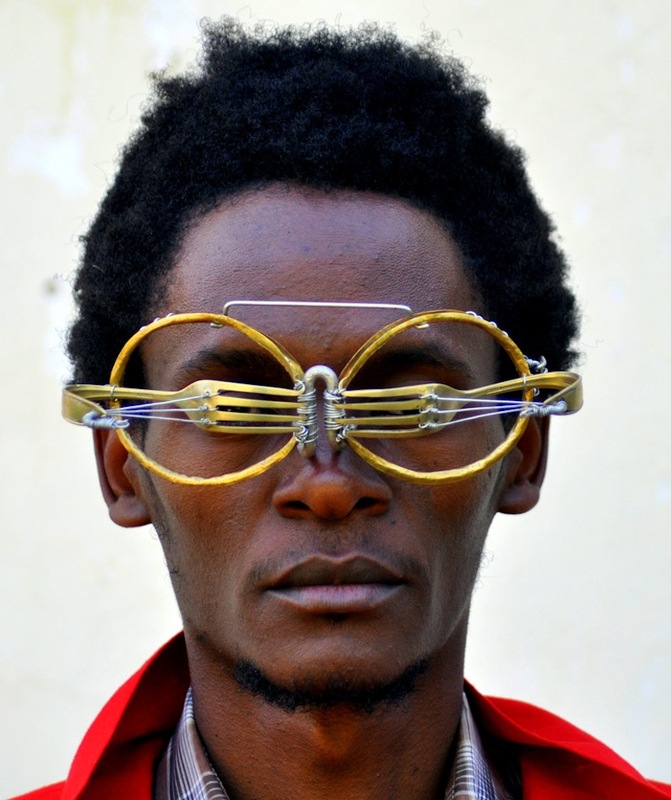 Glasses like these could only come from the mad genius design minds of the folks at Niloca, and they were perfect! a bright candy red pair of Theo Mille+12 glasses were singing their siren song to Katie. Lo and behold…Katie tried them on, and again, they too were just right! We love how they almost GLOW on Katie’s pale skin and light blonde hair. Katie’s journey was complete and she was happy. She returned home, happy to have found her new favorite eyewear boutique and excited about her cool and colorful new specs. AND, she lived happily ever after. 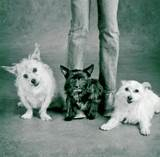 This week’s Customer Of The Week is a Couple. Give a round of applause to Marie and Greg! Don’t they look great in their Theo’s?!? I have a secret to tell you…if you and your partner both wear glasses that you bought from Eye Spy, you will probably be featured as our Customer Of The Week! I have another secret to tell you…if you and your partner both wear the same brand of glasses, like Marie and Greg, then you are almost GUARANTEED to be our Customers Of The Week. 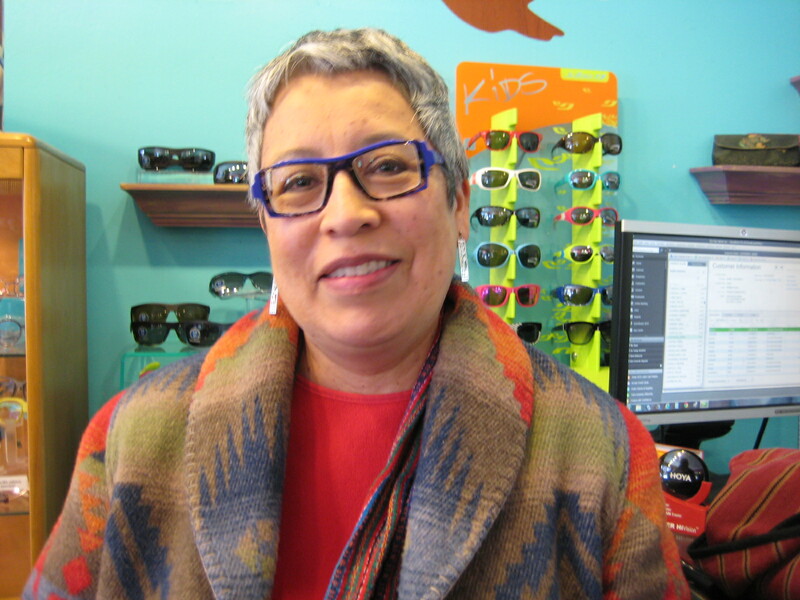 Marie came in looking for an upgrade and our Design Maven helped her pick out the perfect pair of Theo Abricot frames. We think you will agree that both the color and the fit look amazing on her. This frame is such a gorgeous shade of purple and has some really unique cut-out details around the edges. Greg’s Aramis frame is also a cool shape and outstanding color. 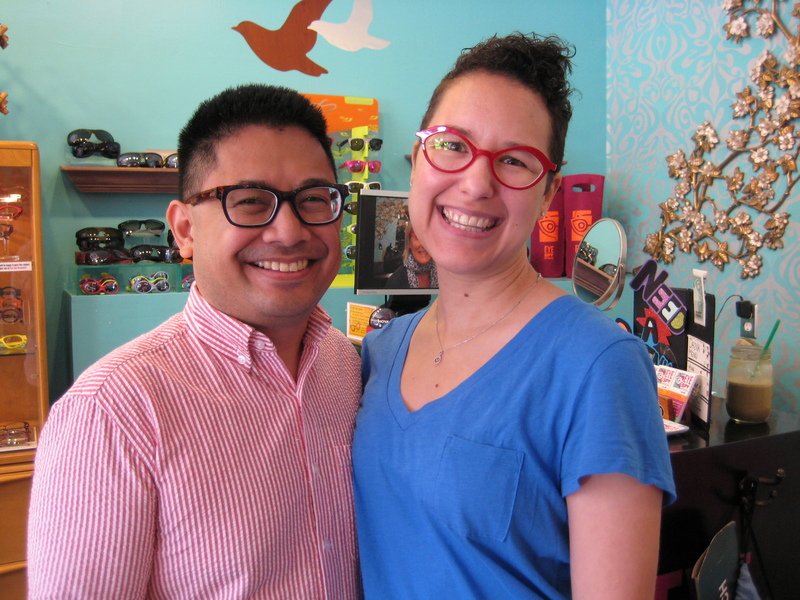 Marie has been a customer for 11 years and Greg has been a customer for 6 years, so obviously they both know how great funky, colorful eye wear can be. We just LOVE couples who have great taste in glasses!